The Siege of Fort Gaines occurred between August 3 and 8, 1864, during the American Civil War. It took place in the Mobile Bay area of Alabama as part of the larger battle of Mobile Bay, and resulted in the surrender of the fort and its defenders. Union forces under the command of Maj. Gen. Gordon Granger landed on Dauphin Island on August 3, 1864, and moved against Fort Gaines guarding the western edge of Mobile Bay. Granger's force numbered about 3,300 men, while 818 troops under the command of Confederate Col. Charles D. Anderson garrisoned the fort. Brig. Gen. Richard L. Page instructed Col. Anderson not to surrender the fort. However, on August 5 the Union fleet ran past Forts Gaines and Morgan, and defeated the Confederate fleet in the bay. Anderson, believing he could not hold out against a combined attack by the Union army and navy, chose to surrender the fort on August 8. With the fall of Fort Gaines, Granger left a garrison at the fort and immediately moved against Fort Morgan to the east. 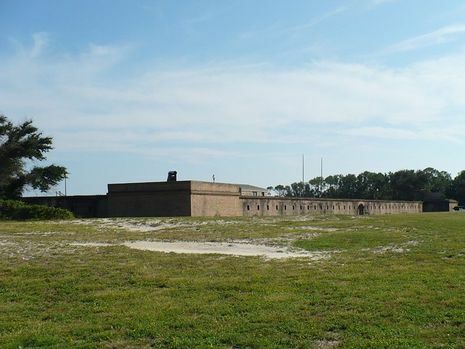 After a two week siege - the Siege of Fort Morgan - General Page surrendered his fort too.